Yesterday was full of activity. We met Russell Cobb, an inspiring, sketch 'n notebook illustrator who is a prolific artist conscious of his image and promotion. He has done a wonderful series of self promotion pieces that have gotten me off my seat...and inspired me to get going. He often works in several notebooks at once--drawing and painting with india ink (again, get going!!) and then working with the art on the computer. He is the president of the AOI (Association of Illustrators) a group of international (mainly British) illustrators who have been around since 1976. They are much like the Illustration Partnership (CF Payne is part of that group)--essentially advocacy, legal aid, lobbying etc. The whole bundle of rights and ownership and pricing. They produce a book annually and a wonderful new magazine call Vroom--def. worth subscribing. His work has kicked me in the booty as is his global/european perspective. Illustration is primordial here--with a focus on childrens books, editorial. The basics. No character design. No graphic novels. No self pubishing. Same sucky pay scale. He told us that the art schools here produce around 3,00 illustration students a year...and only about 3 percent "make it". We visited the AOI with Russell--a small shared studio space with a group of designers/illustrators/product designers called "Big Orange". Will need to investigate later. We got tangled up in the underground but inevitably found the Tate Britain. Quickly saw a ton of art with my heart leaping from my chest over the British School work (this is a 16c. group of painters a la Nicholas Hilliard (one of Queen Elizabeth the firsts painters). Some heart stopping John Singer Sargents. But you can keep all the fusty landscapes and Turner. Torture. Saw a huge show on Hogarth. His paintings you can keep, but the engravings with the funny poetry, the morality stories and the comedy he rendered is really fresh and new. Plus, as I looked at the work, the black and while illustrations and books of Maurice Sendak came to mind...I don't know why, but they align nicely. They are theatrical (foreground/background, staged and posed people, humor and funny details, similar use of line and tone). Another interesting thing about the Tate. The curatorial is wierd...and the lighting is non existant. We are so spoiled to have the Met doing a spectacular lighting, curating and staging job with their blockbusters. 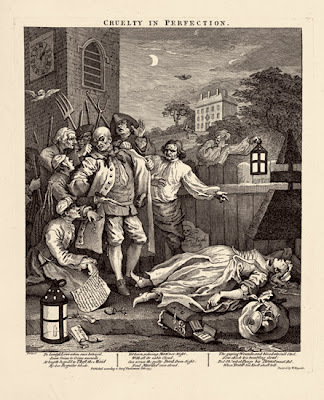 Hogarth, the work was wonderful, the stories good but the overall WOW of the show was lost. Dinner and sleep after that. Sunday, we had a big breakfast in the neighborhood--and we walked down Oxford Street to find the British Museum. What a place!! The siting of the building, the wonderful old pavers and narrow street, the park and seating enclosed within the gates are perfect and perfectly proportioned. Then, to go inside and experience the excellent entry space with the galleries, shops, cafes all nestled and tucked into this expansive, light area that just makes you happy to breathe. We saw the Egyptian stuff and the assyrians just to get our bearings and will come back Friday to see the rest. Their shops are wonderful and before I forget, Rob...the Portland vase is one of their treasures they merchandise. They have ceramic mugs and coasters (all very nicely done and proportioned), a swatch style watch with the figures on the strap, teeshirts (with graphics that bleed...very stylish), and a few books. They take areas of their collections and blow them out accordingly. As an example, they are opening a show on the perception of the British of the New World this week that I hope to see. Again, the tasteful mug, coasters, teeshirt, scarf thing along with these great neckaces and bracelets of drilled beans and corn tied with thin waxed cord. The necklaces are massive (some of just corn, just pinto beans etc) and they are asking 95£ (double it for New World money)--. The British Museum reminds me of the Getty Villa as they are hellbent to do it right...seems less commonplace there. It is interesting that they open each gallery with their Icon or Blockbuster artifact. For instance, first thing in the Egyptian galleries is the surprisingly enormous Rosetta Stone. Upfront...no question...there it is. Centered above it in the background is a huge egyptian head...Bing Bam Boom. We then wandered over to Russell Square, and these terrific playing fields nearby--taking in the neighborhood and trying to get situated for yesterday as we had to be prompt. Got our loadable Oyster cards at the Underground station--which was good as it takes some time to get that squared away. Found a store that sold the complete gear for barristers from the wig to the neckerchief to the gown for about £500. I am planning to ebay watch for that....Lots of fabulous hand lettering everywhere. We see Angela Barrett, a children's book illustrator today. Maybe more museums as our afternoon speaker has bagged as he has had to go to the hospital. So, I am alive and sleeping. We have had blueskies...and real spring weather. Def worth doing with the kids next spring...so much to do and all closeby.